Protein is the basic building blocks of our muscles - should therefore be the best quality. This conditioner meets this and other conditions that could be regarded as the best on the market. Decide whether you want your muscles were built with the best amino acids! 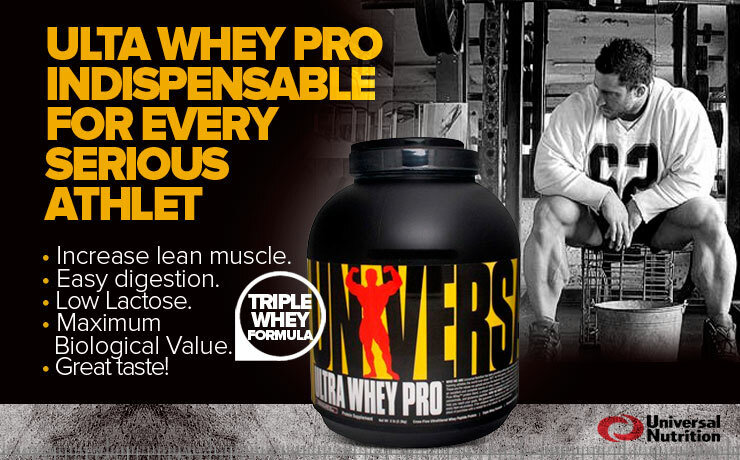 Universal Nutrition Ultra Whey Pro is a nutrient used by the biggest stars of bodybuilding and more. Do you need to add more? It is a world-class product, the composition of which is the quintessence of the highest quality and a guarantee of operation. 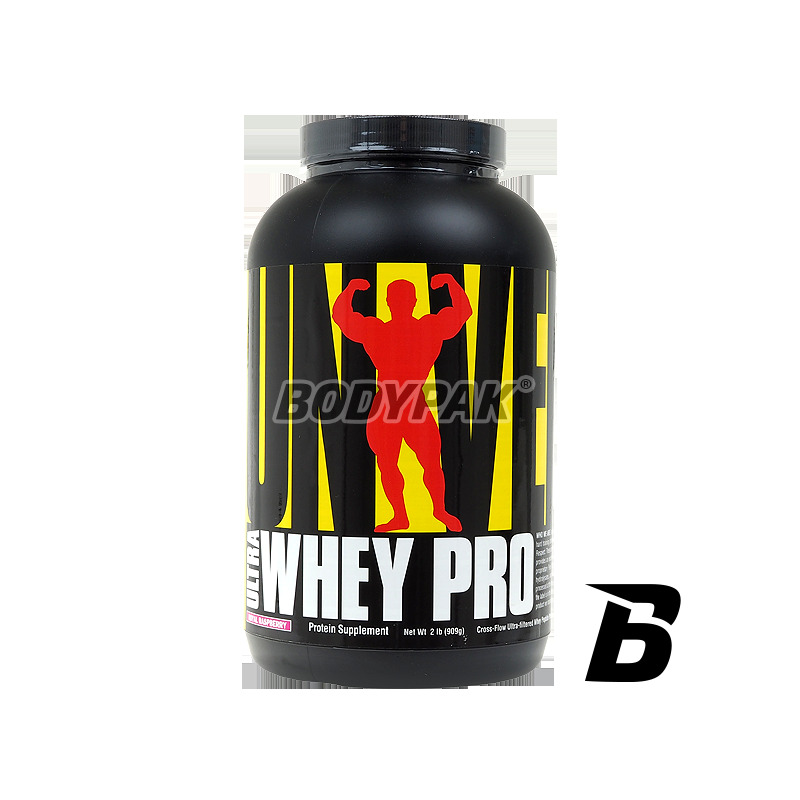 The nutrient you will find amino acids derived from whey protein concentrate (WPC), whey protein isolate (WPI) and hydrolyzed whey peptides - which guarantees fast and even supply your muscle building material. Each of us wants to quickly achieve the best results - with Ultra Whey Pro will be easier and tastier (flavors are refined and certainly will be satisfied with them). Ultra Whey Pro has been further enriched with glutamine peptides hydrolyzed, making it even better protect your muscles against catabolism post-training. Whey protein isolate - very easily absorbed - absorbed from the gastrointestinal tract in just a few - several minutes, has a broad amino acid profile, high biological value BV = 159, rich in alpha-lactalbumin - reducing stress, prevent cancer and diseases, cardiac, lactoferrin, or well absorbed iron and lactoperoxidase, conqueror of bacteria. It has a very low content of lactose and fat which translates into greater comfort digestion and better absorption of taunts. - L-Leucine -wpływa the synthesis of skeletal muscle in several ways: it increases the secretion of insulin, a powerful anabolic present in our body, affects the activity of protein kinase S6 accelerates the phosphorylation of eIF4E-binding protein and affects the degree of association between proteins (EIF) and the 4E eIF4G . All this, despite the complex sounds and naming comes down to a very simple theorem - leucine increases the degree and speed, use protein to build muscle. - L-Isoleucine - is known to glukogennych amino acids, that is, that the body in an easy and fast way can be converted to him necessary for the functioning of energy. This means that we will be able not only to train longer and harder, but also recover faster. - L-valine - a significant effect to reduce fatigue of the central nervous system. In addition, as in the case of the other two amino acids, it is easily converted into energy consumed by the working muscles and thus saving glycogen stored in the liver. Hydrolyzed Whey Peptides - thanks to being subjected to the process of the initial enzymatic digestion are absorbed very quickly providing the body with easily digestible amino acids. Glutamine Peptides - Glutamine is the most abundant in the body amino, performing a number of very important functions: alters the filling process, glycogen by increasing the rate of its synthesis in the liver, as well as by direct conversion to glucose positive effect on the rate of protein synthesis and reduces their disintegration, It strengthens the immune system and prevent diseases that could hinder the training plays an important role in the process of transamination (to the synthesis of new amino acids) is converted into glutamic acid constituting a source of energy for the nerve tissue and perform a number of other important but less significant from our point vision programs. Unleash your POTENTIAL WITH UNIVERSAL ULTRA WHEY PRO! 1-3 servings per day, depending on individual needs. Ingredients: Protein Blend (whey protein concentrate, whey protein isolate, hydrolyzed whey protein), flavor, emulsifier (soy lecithin), anti-caking agent (silicon dioxide), acidity regulator (lactic acid), sweeteners (acesulfame K, sucralose), lactoferrin milk.